Belgian Blue Beef (BBB) cattle were imported to Canada from Europe in the mid 1970s. The Belgian Blue is a docile animal with an impressive muscle mass also often called double-muscle. BBB cattle have a fine bone structure and fine muscle fibers resulting in lean and tender meat. Colors range from black, blue, blue roan to white. 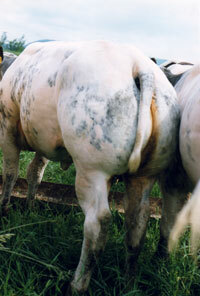 The Belgian Blue is unparalleled among beef breeds. It produces one of the highest yielding carcasses with up to 70 % killing-out on cross bred animals ( 10 % improvement on the maternal breed ) and up to 77 % on full bloods plus 80 % or higher boned-out saleable meat. A butcher's delight. First placings at carcass competitions across Canada and internationally bear witness to these carcass qualities. Commercial Beef Producers are reaping the benefits of the Belgian Blue when full blood bulls are used as a terminal cross sire where proven calving ease equals that of traditional and continental beef breeds. (USDA, Clay Center). Financial benefits are directly linked to the enhanced carcass quality, added "meat" and high cutability. Noticed and recognized by packers, demand is growing and premiums for those crosses it the price to pay. Find out more about the BBB. Belgian Blue International with the full country list of all BBB associations and research on the Belgian Blue Breed. American Belgian Blue Breeders, Inc., US Association for BBB, including membership list.